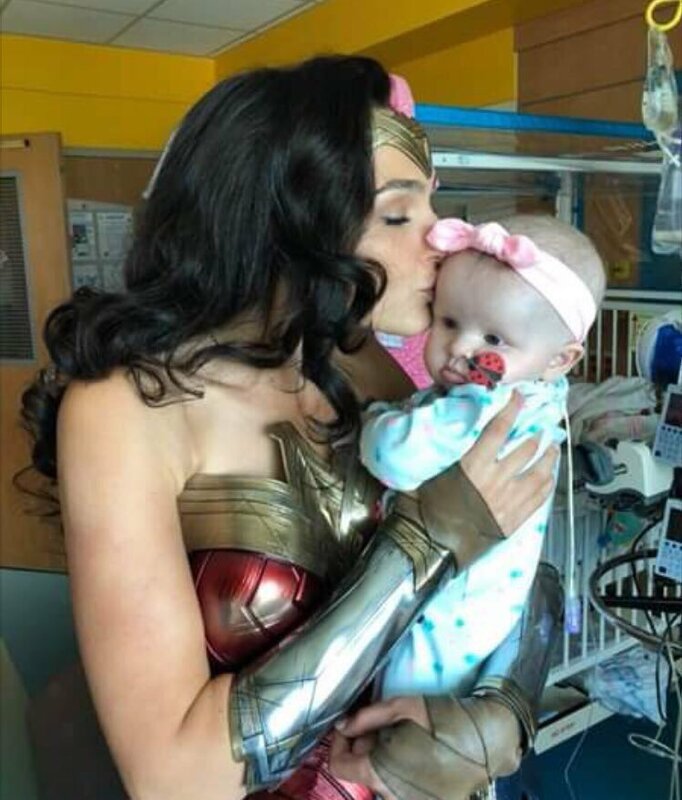 Gal Gadot took a break from filming Wonder Woman 1984 to stop by the Inova Children’s Hospital in northern Virginia to meet with sick kids. Because she's just that awesome. Last edited by Batgirl III on Mon Jul 09, 2018 4:34 am, edited 1 time in total. D'awwwwwwwwww. I love it when actors do stuff like that. Chris Evans, Chris Pratt, RDJ, Tom Holland and Ryan Reynolds have all done stuff like that, which just makes me appreciate them more. There was a really good bit during the filming of the first Avengers film, where a little kid was on the sidelines when Chris Evans as Cap showed up. Chris saw the kid had a plastic Capt. America shield, so he stopped by, talked to him for a while, exchanged shield use tips, and other stuff of Chris just being a great guy. Then, after Chris left, Tom Hiddleston as Loki walked by. The kid also had a Marvel shirt with several characters, including Loki, on it, and called out to him. Tom went over, and the mom asked, "Can we take a picture of you two?" And Tom said, "Can I put him on my shoulders?" So Loki, God of Mischief, ran around in full costume with this little kid on his shoulders, the kid laughing the whole while as his mom took pictures. It was a good day for that kid, and a great day for humanity in general. And then Chris one-upped everyone by helping the clean up crew actually clean up after an action scene, so you see Capt. America in full costume, with a broom, helping sweep up alongside other guys. They really got some good people involved with these movies. Um, sorry, we're suppose to be talking about Gal Gadot and I went on a MCU rant. I think Wonder Woman would approve of us heaping praise on anyone who does such awesome stuff. It's not a rant when you're happy. Audrey Hepburn was a UN Goodwill Ambassador for darn near forever and quite likely the only thing to come out of the United Nations that my cynical misanthropic heart will ever acknowledge as a good thing that body ever did. She was almost as nice as Mr. Rogers. I keep coming back to this story when I'm feeling down. Kevin Conroy was working the food lines after 9/11. Eventually, they get around to talking what they do in the real world. One guy does, another that.. Kevin rather sheepishly says that he does some voice work. Takes them a moment, but he's recognized and is called out for it. Eventually, they poke at him enough to get him to do The Voice. HOLY SH&T! HE IS BATMAN! Robert Downey, Jr., in character as Tony Stark, gifted a little boy a new prosthesis. Get your tissues ready. And, of course, how could I forget... The thrilling saga of Batkid! It is one of the largest and most elaborate Make-A-Wish projects ever, as pretty much everyone in the city of San Francisco came out to help this kid live his dream of being the Batman's sidekick for a day. The documentary is available on Netflix and it's pretty awesome. And of course let’s not forget Shirley Temple and her (IMO far more impressive) career as a diplomat. I'm reminded of Steve Buscemi returning to his original engine company in the aftermath of 9/11 and pulling 12 hours shifts along with the rest of the crew. And absolutely refusing to even confirm to the press that he had done so for months afterward. Best part, nobody would have even known if a sharp eyed fan hadn't noticed him in a photo with his visor up while perched on top of a fire engire.